Bass player Steve Boone (born on Long Island) and drummer Joe Butler (born on Long Island in 1941) had been playing in a band called The Kingsmen based on Long Island in the early 1960’s. By 1964 their band (not to be confused with the Kingsmen from Washington State who had a hit with “Louie Louie”) were one of the top rock and roll bands on Long Island. Their live sets included folk songs put to a rock beat, pop standards and some new hits showcasing the British Invasion. Steve’s brother, Skip Boone, and several three other bandmates filled out the group. In 1964 Joe and Skip chose to relocate to Manhattan. They focused on writing original material and blending a rock bass and drums with their jug band sound. Three other bandmates chose not to move, except Steve Boone, who joined Joe and Skip in New York City’s Greenwich Village, the nexus of the folk music scene. By the fall of that year Joe and Skip had formed a band with several other musicians called The Sellouts. This was the first rock band to play in Greenwich Village, the mecca which of folk music in the USA. As they met with positive reviews, among their new fans were John Sebastian (grew up in Greenwich Village and born in 1944 in New York City) and Zalman Yanovsky (born Toronto in 1944). John and Zal were playing in a folk group with Pappa Denny Dougherty called The Mugwumps in Washington D.C. John and Zal hit is off with Skip and Joe and invited them to join their electric jug band, as they needed a bass player and drummer. John Sebastian had grown up in Greenwich Village and was the son of John Sebastian Sr. who was a world renowned classical harmonica player and John Jr. had himself acquired quite the reputation as blues mouth harpist and guitar player and Zally was rapidly becoming a very respected player who just needed an amplifier that went to 11 on the volume scale. Steve Boone had just returned in December, 1964, from a motorcycle trip around England & Europe. Skip and Joe both mentioned that he might be a perfect fit as the bass player for this electric jug band they were looking to start. The formation of both The Lovin’ Spoonful and The Mamas and The Papas is narrated in the song “Creeque Alley”, a Top Ten hit for The Mamas And The Papas in 1967. Bob Cavallo became the Lovin’ Spoonful’s manager, and Sellouts record producer, Erik Jacobsen, worked with them in the studio. By June ’65 they released “Do You Believe In Magic”. It was the first of seven single releases to each climb into the top 10 on the Billboard Hot 100. The band toured almost non stop. They also were openers for The Supremes which gave them even wider exposure. After their first debut Top Ten hit single, the Lovin’ Spoonful kept the hits coming in the winter of 1965-66 with “You Didn’t Have To Be So Nice,” “Did You Ever Have To Make Up Your Mind” and “Daydream.” In the spring of 1966 the band released “Didn’t Want To Have To Do It”. The song had originally been recorded by Cass Elliott of The Mamas and The Papas. “Didn’t Want To Have To Do It” was a B-side in the USA for “Did You Ever Have To Make Up Your Mind”. But it was released as an A-side single in Canada. The non-charting B-side in the USA climbed up to #6 in Vancouver. It was not a hit single anywhere else in Canada, and got only airplay elsewhere in San Antonio, Texas, and Burbank, California. the Lovin’ Spoonful had an international #1 hit called “Summer In The City,” co-written by Steve Boone and This was the only #1 hit in the USA. In Vancouver the band charted two more songs to #1 with “Rain On The Roof” and “Darling Be Home Soon”. The Lovin’ Spoonful next released “Six O’Clock” and then “She’s Still A Mystery”. Both reached the Top Ten in Vancouver. Two weeks after “She’s Still A Mystery” dropped off the CKLG Boss 30, “Money” appeared on the record survey. “Money” is a song with banjo accompaniment. It is a song about being connected to the right people who happen to know how to make their money and investments grow. In the song, there is a relationship where both partners give each other gifts of money so they can get things on a whim or to “blow” their mind. There is a friend named Bill who is able to help with managing household finances and making regular payments. There is another friend named Joe who needs to borrow money. Since Bill vouches for Joe, the guy in the song lends Joe the dough. Finally, there is someone Bill knows named Hank who owns a bank. Hank is able to make the money invested in the bank account grow based on interest accrued. The song is a whimsical take on having to live in a world where we trade in currency. In recent years, if someone wanted to be like Hank and own a bank, they’d need between 12 million and 20 million to start up the enterprise. Usually, up to 90% of the cash required to start up your own bank can be raised in the community. Still, a person would have to have at least 1.2 million to 2 million of their own cash to put up front to satisfy anyone regulating the creation of a new bank that the project was viable. It was in Venice during the 13th century where the bill of exchange was developed as a legal means to enable international trade without requiring parties to carry large sums of gold and silver. Their use spread across Europe. There was a problem of what to do about people having large amounts of cash in gold and silver coins. It was in the Netherlands that people started to deposit their savings with cashiers. A cashier retained the cash for a fee. In time, cashiers in banks provided other services. These included paying cash to anyone who possessed a written note from a depositor to do so. Notes were kept as proof of payment. In 1695 the first British bank note was issued and stamped “Bank of England.” Initially, the first bank notes were issued to raise funds for military adventures. And so the purchasers of the bank notes could afford large notes and ask for suitable interest on their investment. In 1758, the first person ever convicted of forgery of a bank note was sentenced to hang in London. In 1797 the Bank of England decided to make bank notes more accessible to ordinary English citizens when they issued one and two pound notes. The year “Money” was on the charts, if you invested your money in the stock market in 1968, the average return on investments was 3.14% according to the Motley Fool. If you invested your money in a bank account in 1968, the prime interest rate was 6.31%. The year after “Money” was on the pop charts, the first ever ATM was installed at the Rockefeller Center in New York City on September 2, 1969. In the 1960’s banks strongly encouraged citizens to open bank accounts by offering them a free toaster or electric clock. 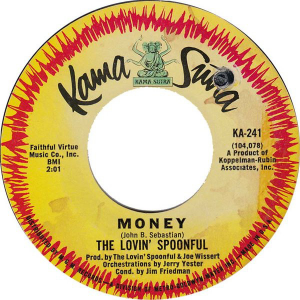 In the 1960’s quite a few songs expressed detachment from the value of money. In 1963, The Kingston Trio didn’t care about a “Greenback Dollar,” preferring things they understood like a song and a guitar. The Beatles didn’t care much for money ’cause money “Can’t Buy Me Love.” Paul McCartney once told the press regarding the song, “the idea behind it was that all these material possessions are all very well, but they won’t buy me what I really want.” In 1968, Ray Stevens was singing about someone he called “Mr. Businessman.” This was a guy focused on security and possessions: “bigger cars, bigger houses, term insurance for your wife.” The character in the song is missing out of his children growing up and smelling the roses. However, Barrett Strong reminded people who didn’t have their feet on the ground: “the best things in life are free, but you can give them to the birds and bees” in “Money (That’s What I Want)”. After “Money” was released, John Sebastian left the Lovin’ Spoonful in 1968 to pursue a solo career. He performed at Woodstock in 1969 and had a #1 hit in the mid-70’s called “Welcome Back”. He also became a session musician on a variety of tracks including “If You Could Read My Mind” by Gordon Lightfoot, “Deja Vu” by Crosby, Stills, Nash and Young and “Roadhouse Blues” for The Doors. Sebastian has also contributed to soundtracks for a number of children’s TV shows and films including The Care Bears. In 1993, Sebastian authored a children’s book, JB’s Harmonica, about a young bear whose musical aspirations are overshadowed by the talents of his famous musician father. John Sebastian has declined offers to join the reformed Lovin’ Spoonful on tour over the past 26 years. This left Butler, Yester and Boone to carry on with session musicians to round out further recordings including their #2 Vancouver hit, “Never Going Back” in the summer of 1968. From 1965 to 1969 the Lovin’ Spoonful released seven studio albums and charted ten Top 40 singles onto the Billboard Hot 100. 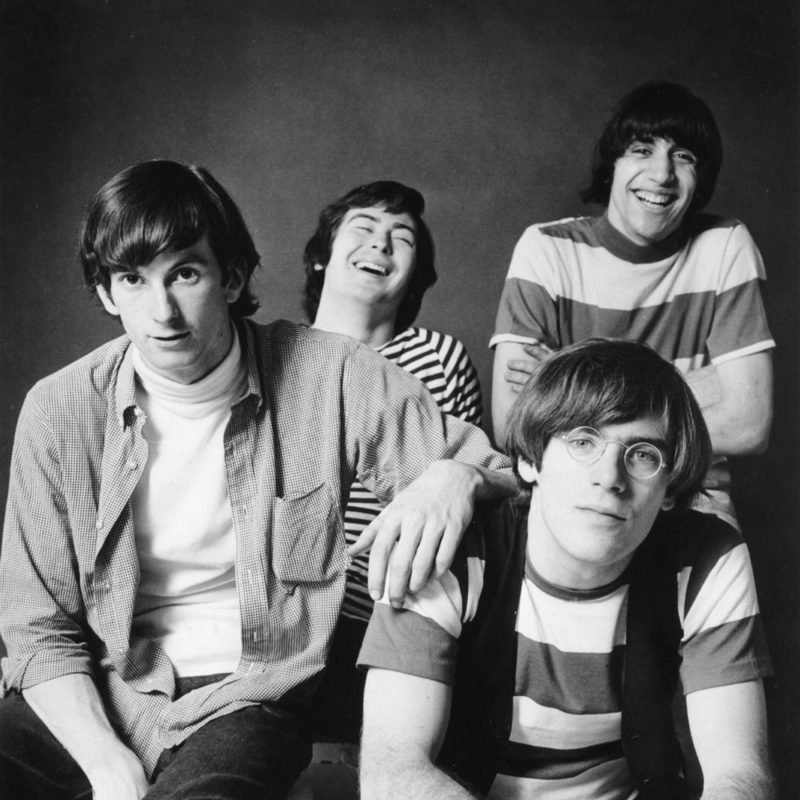 In Vancouver the Lovin’ Spoonful charted 16 songs into the Top 20, and twelve of these reached the Top Five. After the Lovin’ Spoonful broke up in 1969, Joe Butler initially got a role in the Broadway production of Hair. He continues to play with the band since it’s reformation in the early 90’s and is the lead singer. Jerry Yester went on to be a producer arranger for The Turtles, Pat Boone, Tom Waits and Zal Yanovsky’s solo album in 1973. Yester continues to produce and arrange records for recording artists and performs occasionally as a solo artist, as well as with the Loving Spoonful. Since 1991 the Lovin’ Spoonful has re-formed and often been on tour with Joe Butler, Jerry Yester and Steve Boone the core of the live band. The band recently appeared for three nights in concert in Laughlin, Nevada, in March 2018. On January 20, 2018, they were one of the acts performing in a Where The Action Is Cruise departing out of Fort Lauderdale, FL. Meanwhile, John Sebastian continues to tour as a solo act and has scheduled concerts between May and November 2018, in Texas, Massachusetts, New York and Maine. “Lovin’ Spoonful 50th Anniversary (Three Original Members Steve Boone, Joe Butler & Jerry Yester),” The Iridium.com, Washington D.C., March 4, 2016. Bill Barker, “How Have Stocks Fared the Past 50 years? You’ll Be Surprised,” Motley Fool.com, April 22, 2016. Valerie Ashton, “See Interest Rates Over the Last 100 Years,” GOBankingRates.com, July 14, 2017. Tony Armstrong, “A History of Banking, From Free Toasters to Chatbots,” nerdwallet.com, February 9, 2017. A History of British Bank Notes, Britishnotes.co.uk. Rebecca Harrington, How to Start Your Own Bank, November 11, 2010. Badman, Keith. The Beatles: Off The Record. Omnibus Press, London, 2000.